Topographical Map of the 'Egg harbor and Vicinity' New Jersey No 16. 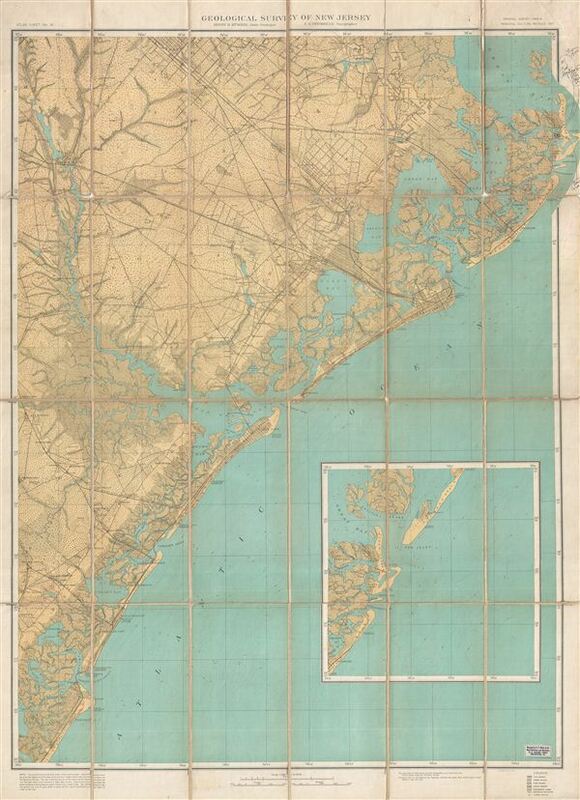 This is a scarce example of the 1907 U. S. Geological Survey southern New Jersey in the vicinity of Atlantic City and egg Harbor. Centered on the Great egg Harbor, the map covers from Great Bay to Peermont, including Ocean City, Atlantic City, Sea Isle City, and Brigantine. An inset of the Great Bay area is included. The map offers copious topographical detail in addition to identifying towns, roads, rivers, railway lines, and some city street grids. Originally dissected and mounted by e. P. Noll and Co., 21 N Seventh Street, Philadelphia, PA, this map was created under the supervision of Henry B. Kummel, New Jersey State Geologist. The topography is the work of C.C. Vermeule. Very good. Dissected and mounted on linen in 24 sheets. Linen split at few places. Markings by pen in right margin. Some erased pencil marks here and there in the upper right quadrant.